We kicked off our morning with a “whodunit murder mystery” to put into practice the G.R.A.D.E decision making model. Nirish walked us through the decision-making process by highlighting the steps we go through on a day-to-day basis without conscious awareness we are doing so. 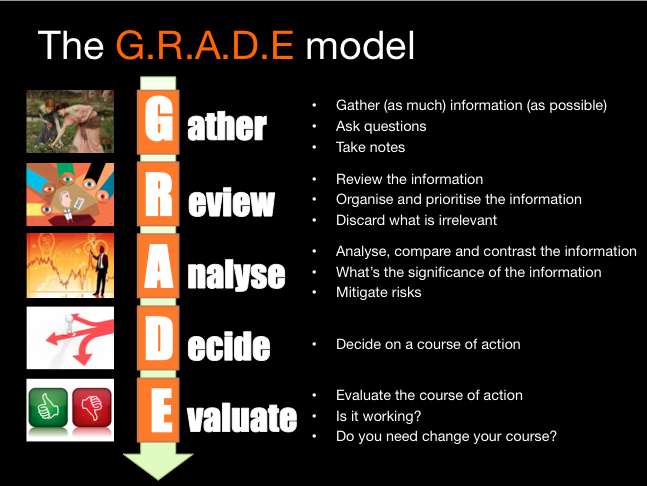 So what is the G.R.A.D.E decision making model? As a team, we were required to go through the evidence from a Cluedo-style crime scene and decide who was responsible for “Bob’s” demise. We followed the G.R.A.D.E model to gather all the information, review the evidence, analyse what we had gathered, decide on our perpetrator and evaluate if we had come to the right decision. 1. Digressing from the intended plan & jumping to conclusions is very easy. When working together to gather evidence, we often found that we were already straying into the analysis phase by trying to string aspects together to come up with a theory. We had to remind ourselves to take a step back and gather ALL the evidence before trying to piece the puzzle together. It was hard not to let our emotions get in the way. We devised all sorts of conpsiracies and theories about who killed Bob (we did let our imaginations run a little wild). However by constantly referring to the G.R.A.D.E model we were able to reposition our investigations to consider information and evidence alone! While intuition plays an important role, it is very easy to let our past experiences, biases and judgements affect and shape our perceptions. This was a great exercise in “objective” decision making. A phenomenon known as confirmation bias refers to the tendency for people to focus on information that helps them confirm what they already believe to be the truth. We had to be careful that we didn’t exclude or undervalue the relevance of other bits of information that didn’t necessarily ‘fit’ into our theory. This is why the ‘gather’ phase was important. We were able to go back and re-review up all the bits and peices we had gathered at the start of the exercise to ensure we hadn’t overlooked or ignored information. Only then could we be certain that our decision was the most correct one. We spent quite of bit of time in the “decide” and “evaluate” phases going around in circles. In fact we had uncovered the truth some 20 mins before we called case closed on the whole thing. While analysis is a key part of the process, if we over-analyse we run the risk of ‘analysis paralysis’ – that is so much time is being spent analysing that a decision actually never gets made (or takes too long to get made). Time being a luxury we can’t always afford. Overall a great group activity! If you would like to learn more about this or get a copy of the crime scene investigation, get in contact with us! This entry was posted in Brown Bag Breakfasts and tagged decision making, GRADE model by danielleux. Bookmark the permalink.